Yossef S. Ben-Porath, PhD, is a Professor of Psychology at Kent State University. He received his doctoral training at the University of Minnesota and has been involved extensively in MMPI research for the past 24 years. He is a co-developer of the MMPI-2-RF and co-author of test manuals and numerous books, book chapters and articles on the MMPI test. 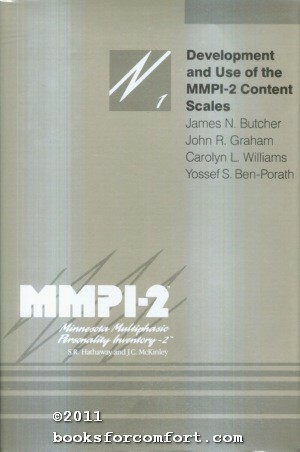 His recent book, Interpreting the MMPI-2-RF provides detailed and practical instruction for interpreting the MMPI-2-RF, the most recent version of the MMPI for adults. He is Associate Editor of Psychological Assessment, and a member of the editorial board of several psychology journals. His clinical practice involves consulting to agencies that screen candidates for public safety positions and conducting criminal court ordered forensic psychological evaluations. Williams is associate professor of epidemiology in the School of Public Health, University of Minnesota. University Press, 1977, 1987) and the co-author of Psychological Testing, Development and Use of the MMPI-2 Content Scales, and MMPI-A Content Scales: Assessing Pyschopathology in Adolescents.